Watching Pandora's Box, and I think it may be my favorite silent movie ever. I've always liked Louise Brooks' style and considered her a fashion icon but I hadn't seen her on film until Pandora's Box. Now I'm going to go on Neftlix and add every film of hers I can find to my queue. This may be my favorite piece you have done! Pandora's Box was an amazing film, so ahead of it's time. Glad you're enjoying Pandora's Box. That one and Diary of a Lost Girl are the two I like best, though The Show Off is great too. Windy Riley Goes Hollywood is good, but only because you get to hear Louise speak really. I absolutely LOVE this pic too! It's definitely one of my new favorites of yours. This is incredible. I love it. Louise is amazing. Enjoy watching her films. I've not seen nearly enough. I love that image because it captures my favourite Louise - the fun flapper one. She's great in gloomy Germanic mode, but those soulful pictures tend to overshadow her more joyous side... so make sure you watch Love 'Em and Leave 'Em! It's a hoot. Oooo. Weirdness. I just got Pandora's Box in my mailbox (Netflix). Going to watch it this weekend. Oooo. Linda- Thank you! I know, it's hard to believe it was made in the 1920's! Juliette- Thank you :) Thanks for the tips! I did hear her speak in an interview, but it was from the 70's or something.. I'd love to see her in a talkie! Keith- Thank you! I obviously haven't seen enough either.. now I know what I've been missing! Matthew- Thanks! I thought at the beginning of the film she was the epitome of a flapper, really fun and happy! I loved how she just sort of danced around so carelessly! I might be wrong- Thank you! Julita- that is weird! I hope you like it! Oh, that is beautiful, Kate. 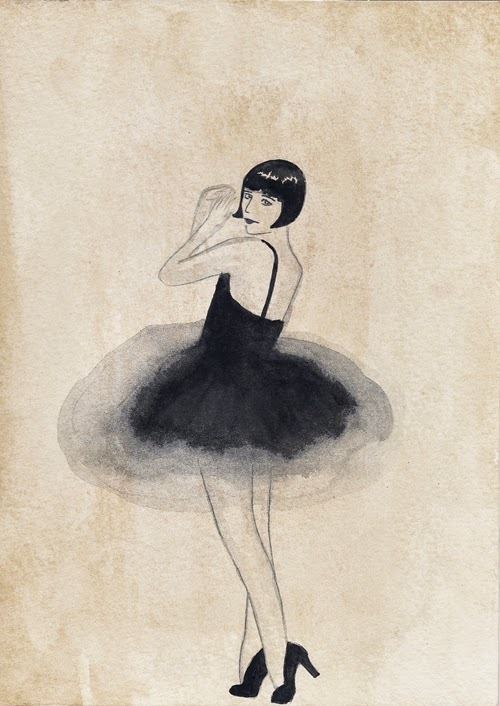 Louise Brooks was the first silent star I really discovered, and I have always had a bit of a crush on her from the very beginning. Pandora's Box is definitely one of my favourite silent films! Louise is my favorite silent star!